Sterlco® Float and Thermostatic (F&T) steam traps are preferred for efficient, economical vacuum and pressure service. F&T traps are highly recommended for applications where large volumes of air are present on start-up and where condensing rates can vary widely. F&T traps are ideal for service in health care institutions, apartments, educational facilities, offices and other public areas as well as in business and industry. The FT-69-3-15 is available in 3/4” pipe size. Float and Thermo- static steam traps are designed for ease of installation and simplified, minimal maintenance. Condensate initially fills the trap body to a predetermined level, which is sufficient to seal the valve seat opening. As the condensate level continues to rise, the float will rise causing the valve to pull away from the seat. Condensate will then be discharged into the return line through the trap outlet. The rise and fall of condensate level causes a continuous discharge which is typical of F&T traps. Air entering the trap is discharged through the thermostatic vent. The opening and closing of the vent is dependent upon the temperature surrounding the thermostatic element. As the element cools with more air accumulating, it opens to allow the air to vent to the atmosphere. Install F&T traps in steam applications such as Instantaneous Heaters, Steam Humidifiers, Steam-Jacketed Vessels, Unit Heaters, Sterilizers and other similar equipment. 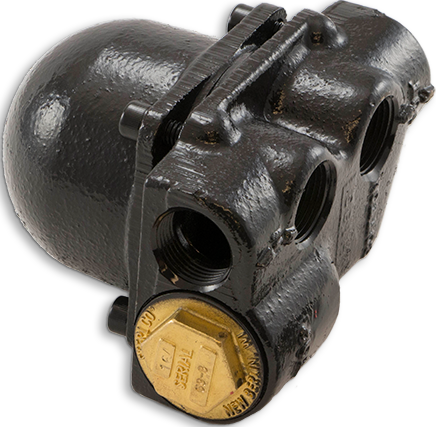 All Sterlco® steam traps designs provide modulating control and non-condensable gas venting. Sign up today to receive the latest news, product updates and new product releases.